In the smallest spaces, you will find our best ideas : MAGCO ELECTRIC WIRE ROPE HOIST . The distinguishing characteristic of the MAGCO CRANES electric wire rope hoist is the extremely large rope drum, which has a protective effect on the rope. Very safe and efficient operation is furthermore guaranteed by a number of other standardized features, and all that for only a small investment. It’s no secret that we are really proud of our MAGCO CRANES wire rope hoist, because as far as wear and tear, hook movement and approach dimensions are concerned it simply leaves the competition standing. Firstly, someone has to come along and produce something which is even slightly comparable, but even then you would not be satisfied with the copy, would you? Among experts, MAGCO CRANES electric wire rope hoists enjoy an excellent reputation, due to their outstanding design and the many extras that come as standard. 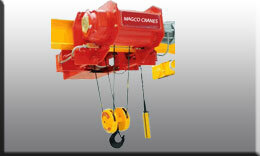 The MAGCO CRANES hoists also include a wide range of features such as the incredible ratio between the diameters of the rope drum and the load rope, the powerful drive system, minimum load sway and small approach and structural dimensions. The application of technologies that reduce wear of the high-quality materials guarantees an extended service life of the equipment with high functional reliability. See for yourself what MAGCO CRANES electric wire rope hoists by SWF can do for you. If you are looking for maximum flexibility, the MAGCO CRANES is the right solution for you. We increased the size of the drum and everything else became smaller. Minimum hook movement, reduced load sway due to variable speed control of the load via the standardized frequency inverter. Robust industrial design, standardized model groups. Advantage : highest possible efficiency and optimum usage of space.